Banana leaves can be found in most Latin American or Southeast Asian markets - usually, they're found in the freezer section. They have a pleasant scent that smells somewhat like tea, and wrapping fish in banana leaves and steaming them imparts some of the banana leaf flavor in them. 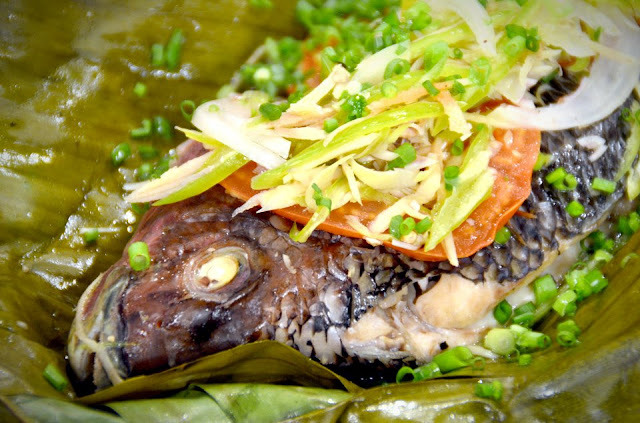 Plus, the banana leaf acts as a convenient little packet for holding other ingredients with the fish, and keeps the fish from falling apart or losing delicious juices. 1 Season tilapia with salt, pepper, calamansi juice. 2 Lay banana leaves on chopping board. Drizzle with olive oil. Fill inside half portion of ginger, garlic, red onion, green chili, tomatoes, lemon grass. 3 Place on top remaining half portion of ginger, garlic, red onion, green chili, tomato, lemon grass. Season with salt and pepper and drizzle with olive oil. 4 Wrap with banana leaves, then place in steamer for 1 hour or until done.